KUALA LUMPUR: The Malaysian Anti-Corruption Commission (MACC) is in the midst of drafting a plan to transform and improve its operational, preventive and human resource aspects in order to combat corruption more effectively. The plan is set to be implemented next year, according to MACC commissioner Datuk Seri Mohd Shukri Abdull. Speaking to Bernama in an exclusive interview recently, he said operations-wise, new investigation approaches would be introduced to optimise investigations and use of experts. The proposed approaches include intelligence-based investigation, asset tracing, financial analysis-based investigation and undercover investigation. The transformation of the human resource aspect will involve changes related to the restructuring of posts, deployment of officers based on their skills and academic qualifications, and recruitment of experts in specific sectors. “As for the preventive aspect, the changes include the introduction of new initiatives such as the corporate integrity pledge, corruption risk management, inspection activities and advisory services that focus on issues (related to corruption) that are of concern to the people,” he said. He said if cheating offenders can be subject to caning, the same punishment should also apply to those convicted of graft as it was a more serious offence. Under the MACC Act 2009, bribery offenders face a maximum 20-year jail sentence and fine. “There are times when the offender is merely given a one or two-year jail term, in fact, a one-day jail sentence has also been imposed before. Of course, there have also been offenders who were given 10-year imprisonment but if caning is implemented, it will act as a bigger deterrent,” he explained. Mohd Shukri opined that corrupt practices occurred in this country simply because of the availability of wide space and opportunities for such criminal acts. “Greed and lack of integrity are also contributive factors,” he said, adding that statistics have shown that civil servants made up the bulk of offenders. According to MACC statistics, those arrested for corruption from January to November 2018 comprised 421 civil servants, 213 members of the public, 175 private sector employees, 23 government-linked company (GLC) staff and 43 from other sectors. Between 2009 and November 2018, MACC recorded a total of 381 prosecutions. In 2010, there were 237 cases of convictions; in 2012, 212 convictions; and 2017, 216 convictions. In 2017, MACC opened investigation papers on 863 cases, made 879 arrests and produced 373 people in court. The same year also recorded 216 cases of convictions. From January to November 2018, MACC opened investigation papers on 821 cases, arrested 821 people and produced 280 people in court. So far this year, there have been 196 cases of convictions. “Well, of course, history was created this year when prominent people were detained and prosecuted,” Mohd Shukri added. The 1Malaysia Development Berhad (1MDB) case, dubbed as the biggest financial scandal the world has ever seen, is naturally the largest ever case MACC has investigated into. Former Prime Minister Datuk Seri Najib Razak, 65, is facing 25 charges related to the 1MDB scandal. 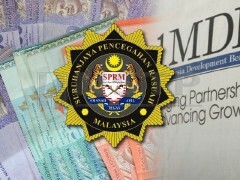 The charges comprise 21 under the Anti-Money Laundering and Anti-Terrorism Financing Act 2001 and four for abusing his position as prime minister, finance minister and IMDB advisory board chairman to receive bribes amounting to RM2.3 billion. Pointing out that the smallest graft case undertaken by MACC involved a policeman who had accepted a bribe of RM20, Mohd Shukri said where corruption was concerned, the value of the bribe was immaterial to his agency. “We’ve to look at it more widely because of the implications of such an act. A crime is a crime, whether one is accepting a bribe or involved in prostitution, illegal gambling or smuggling firearms,” he said. The MACC’s corruption preventive programme is among the strategic measures it has taken to instil an anti-corruption mindset into targeted groups such as youth. Mohd Shukri said on that note, MACC was collaborating with large youth-linked non-governmental organisations such as the Malaysian Youth Council (MYC), which has 39 affiliated organisations with a membership of 50,000, and the Malaysian Association Youth Clubs (MAYC) to which 142 organisations are affiliated. “We want to take our anti-corruption message throughout the country through MYC and MAYC. These NGOs are also very supportive of our agenda to fight corruption,” he said. Since 2007, MACC has also been setting up corruption preventive secretariats at public institutions of higher learning throughout the nation. Today, 108 such secretariats have been established not only at public institutions but also at private institutions, teachers training institutes and MARA educational institutions. To further empower these secretariats, MACC has rebranded them as the ‘Anti-Corruption Student Force’ in the hope that more students will participate in anti-corruption programmes held at their respective campus. “We’ve to focus on the students as they are this nation’s future leaders,” he added. Being a member of the Youth and Sports Ministry’s Institute for Youth Research Malaysia, MACC has also been able to insert its anti-corruption agenda as one of the inputs for the National Youth Action Plan. MACC has also worked with Universiti Kebangsaan Malaysia on a pilot project on the introduction of Integrity and Corruption as a subject for students. In view of the effectiveness of the project, other universities such as the International Islamic University Malaysia, Universiti Putra Malaysia, Multimedia University and Kolej Universiti Islam Melaka have expressed their interest in offering the same subject to their students. Meanwhile, as part of its anti-graft drive, MACC’s Community Education Division has also actively carried out programmes and activities to educate the public, as well as employees in the government and private sectors and GLCs. Among the programmes it has carried out are signing the corruption-free pledge, having discussions on corruption prevention and creating more awareness on the need to cultivate integrity. Mohd Shukri said to ensure the success of its anti-corruption “warfare”, the community too has a role to play. “We already have the platforms for people to play their part to help us wipe out corruption. Among them is the Friends of Anti-Corruption Revolution Movement which is open to the public and now has 160,000 members,” he said. MACC also goes on walkabouts in public places from time to time to meet the local community and impart their anti-corruption message to them.